Fyber, one of AppsFlyer's integrated partners, is developing a next-generation monetization platform for mobile publishers. In addition to click-based mobile attribution, Fyber also offers cost and view-through attribution, which you can track with AppsFlyer. 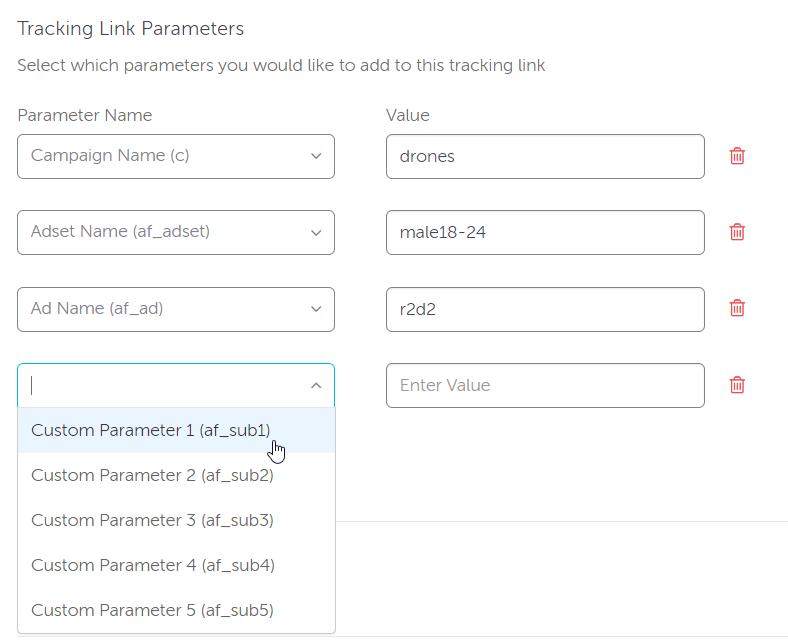 To configure your campaigns with Fyber, follow the steps below. Enter "Fyber" in the search field and click on its logo to open Fyber's configuration window. 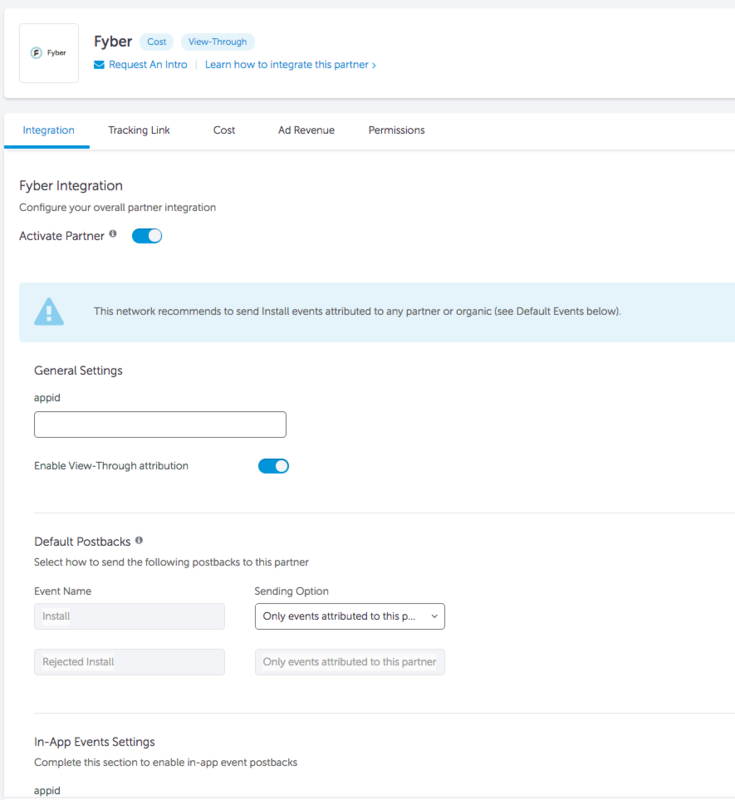 Fyber's configuration window includes 4 active tabs: Integration, Tracking link, Cost and Permissions. Click on the items below to read about the tabs setup. Fyber connects with AppsFlyer via a unique network ID. If you don't already have the Network ID, you must obtain it from Fyber to continue with the integration. Toggle this to ON if you want to attribute view-through installs from Fyber. The view-through lookback slider is available on the tracking link tab (described below). AppsFlyer can send automatic postbacks to Fyber following user installs and re-engagements. Use this section to define the source of the users that allow sending these postbacks. Select Only events attributed to this partner for events coming only from users attributed to Fyber. Select Events attributed to any partner or organic to have your entire user base available to be reported to Fyber. In this section you can map your AppsFlyer events with Fyber via postbacks. 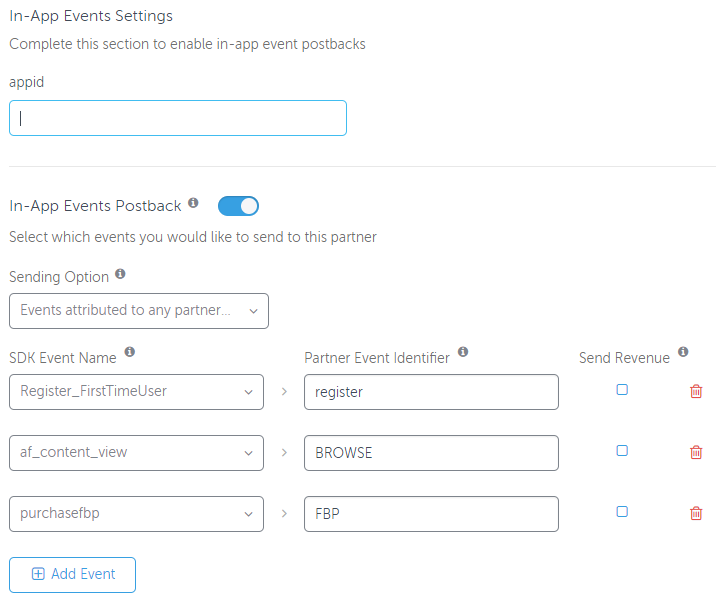 Partner Event Identifier The unique name or ID of each event as defined on Fyber's side. Obtain the corresponding Event ID from Fyber and set in the text field. 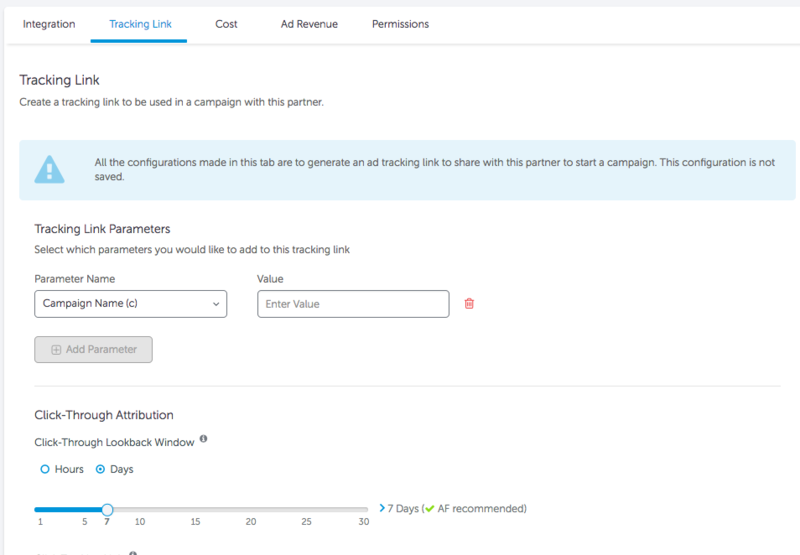 In this tab, you can create the tracking links you want to send to Fyber for tracking Fyber's campaigns, ad sets or even single ads. Note that AppsFlyer DOES NOT save your generated partner's tracking links. Campaign - add it to compare different campaigns running with Fyber. Adset - set ad set names to compare different ad sets within specific Fyber campaigns. Ad Name - set ad set names to compare different creatives within specific ad sets within specific campaigns Fyber. This slider allows you to set the maximum time from click to install. Only installs (first launches) that take place within the lookback window may be attributed to Fyber. This is the tracking link that contains all the setup information you have set for it. Send it to Fyber to be activated when leads click on a corresponding ad. This slider allows you to set the maximum time from impression to install. Only installs (first launches) that take place within this lookback window, following an ad impression, are attributed to Fyber, providing there was no other relevant ad click. The impression tracking link contains similar attribution data to the click tracking link (besides the different lookback window). Send it to Fyber to be activated when a corresponding ad is watched, usually for 1 second or more. 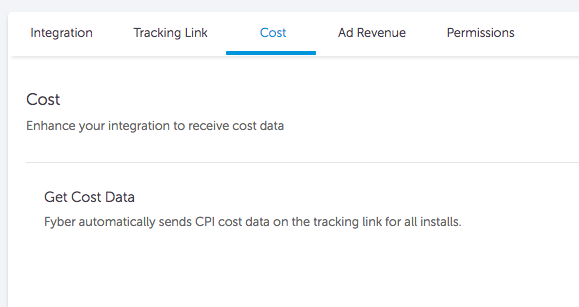 Fyber automatically sends CPI cost data on the tracking link for all installs. 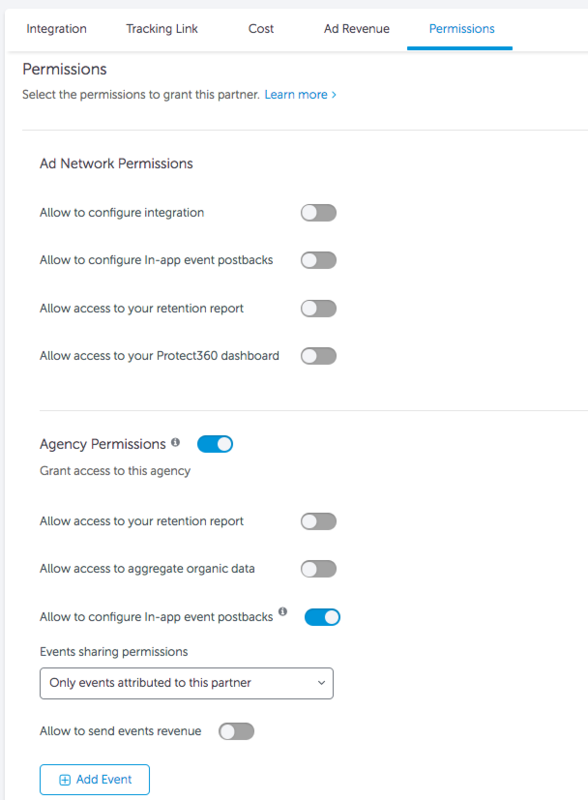 In this tab, you can select the permissions to grant Fyber, whether the partner acts as an ad network, agency or even both. Note that even if attribution is disabled for Fyber, the permissions tab is active and you can grant control to Fyber.